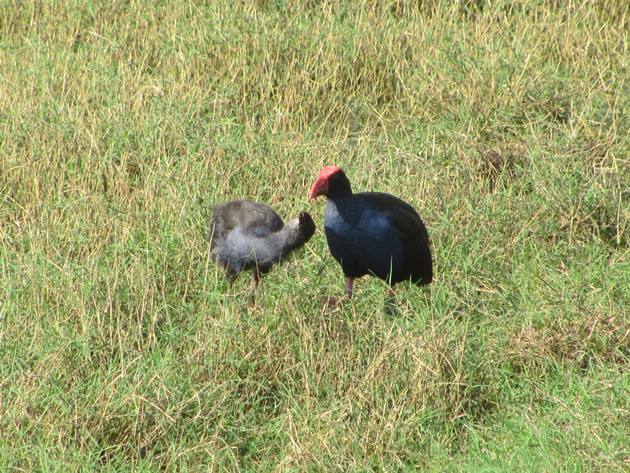 The Australasian Swamphen used to be considered to be a sub-species of Purple Swamphen, but has now been determined to be a separate species namely Porphyrio melanotus melanotus in the north and east of Australia and Porphyrio melanotus bellus in the south of Western Australia. This year we have encountered both sub-species of Australasian Swamphens in Western Australia and there has been a lot of movement of the birds throughout the north of Australia as a result of the very wet weather we had at the start of the year. The flooded highway south of Broome became an excellent place to go birding and there were incredible numbers of Australasian Swamphens. 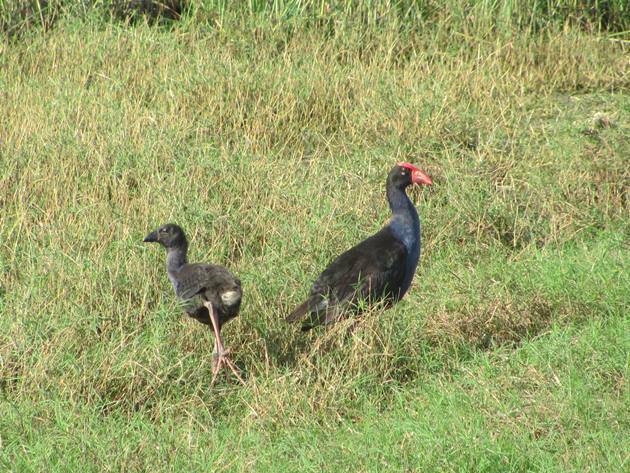 In a normal year there are very few Australasian Swamphens around Broome, but this year they suddenly appeared out of nowhere and bred. 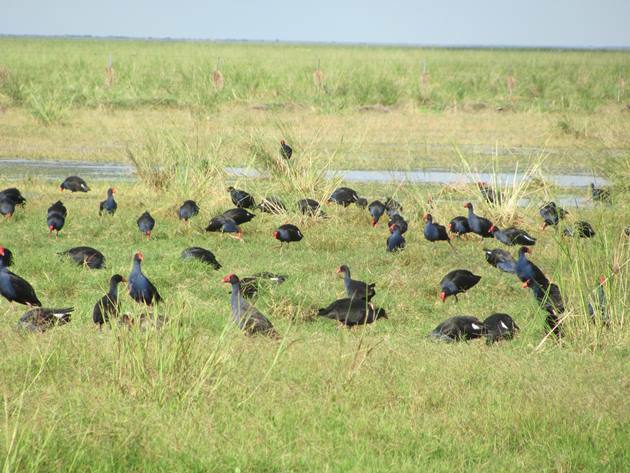 It has not just been an invasion of Plumed Whistling-Ducks, but Australasian Swamphens too! 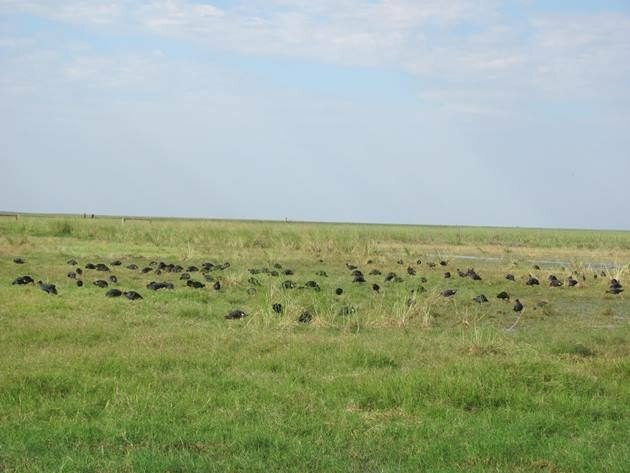 The header photo just shows a handful of the number of Australasian Swamphens that were present at the edge of the road a few weeks ago. 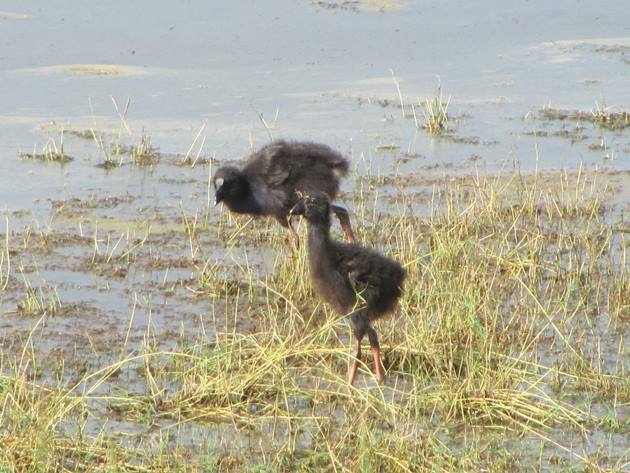 Over the weeks that we drove along the edge of the highway watching the Australasian Swamphens we saw them develop very fast and they often appeared to be in crèches. There would be several birds of various stages of development together and often no adult birds present in the immediate vicinity. 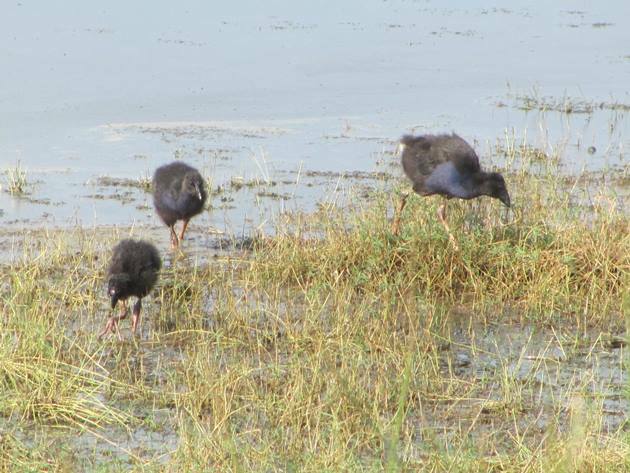 There were also some Australasian Swamphens that were being actively fed by their parents and there was ample food for them for several weeks until the land started to dry out. 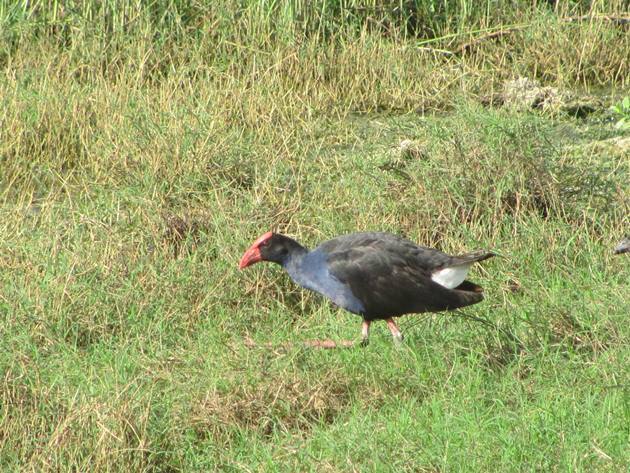 Over the past couple of weeks the land started to dry out very rapidly and all of a sudden there was not a single Australasian Swamphen to be seen in the area. Some of them have dispersed to remaining ephemeral lakes around Broome, but there are not the numbers there that we observed close to the highway. 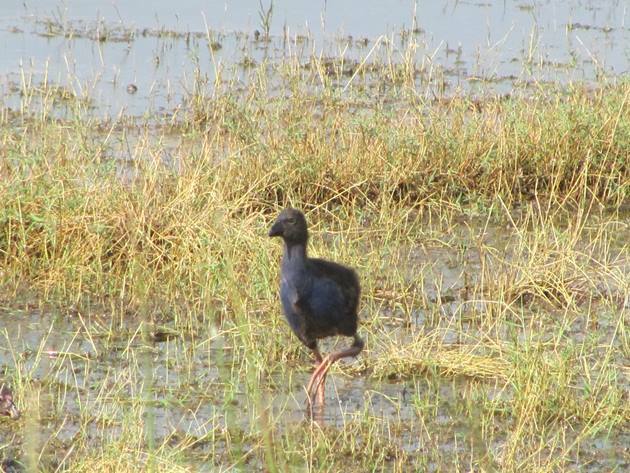 It is another mystery in the birding world as to where the large numbers of Australasian Swamphens came from and where they all went to. How did they know that so much rain was falling in Broome early this year and that breeding conditions would be ideal and worth travelling for?! One of the incredible things about nature is that it is incredible! One of the wonders of birding is that you wonder what you will see on each birding trip and as the environment changes the birds change. It is something to look forward to every day!